exciting Q&A Interview with Margaret Greenberg, MAPP, PCC, and Senia Maymin, MAPP, MBA, PhD, Positive Psychology executive coaches and authors of Profit from the Positive: Proven Leadership Strategies to Boost Productivity and Transform Your Business. This is an essential guide to no-cost, no-permission positive strategies that business leaders at any level can use immediately to increase productivity, collaboration and profitability. Whether you lead three employees or 3,000, this book shows you how to increase productivity, collaboration, and profitability using the simple, yet powerful tools from the new field of Positive Psychology. Featuring case studies of some of the most forward-thinking and successful companies today – Zappos, Google, and Amazon to name a few – Profit from the Positive provides over two-dozen evidence-based tools that “business schools will be teaching in ten years” (Shawn Achor, New York Times bestselling author of The Happiness Advantage). The best part? These strategies don’t cost a dime to implement! Businesses will not need to hire expensive consulting companies or go through internal red tape to secure permission to begin implementing these tools immediately. Trained by Dr. Martin Seligman in his MAPP program at the University of Pennsylvania, Greenberg and Maymin have translated the scientific research and finally made it accessible to the business world. For well over a decade, Positive Psychology researchers have studied topics such as productivity, resilience, motivation, collaboration, and much more, seeking answers to questions that businesses wrestle with. And who better to present it than Greenberg and Maymin, highly-regarded executive coaches to the business world. With their knowledge of the challenges faced by business leaders, the authors provide a wealth of strategies for applying positive psychology research to business settings, including ways to infuse positivity into meetings, manage more from strengths than weaknesses, hire people based on values, challenge self-limiting perspectives, develop resilience, build productive teams and leaders, and create engagement by recognizing employee accomplishments and focusing on positive performance evaluations. Readers of Tom Rath, Malcolm Gladwell, Chip and Dan Heath, Marshall Goldsmith, and Dan Pink will especially enjoy the book. 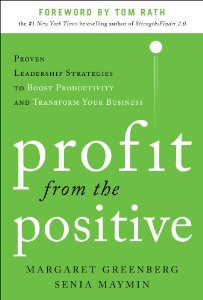 Profit from the Positive has been endorsed by bestselling authors including Gretchen Rubin, Tony Hsieh, Adam Grant, and Chris Brogan. These no-cost, no-permission tools have been successfully implemented by business leaders, managers, entrepreneurs, executive coaches, and human resource professionals at companies ranging from Google to Aetna. For more stellar reviews of Profit from the Positive click here. Margaret and Senia, already accomplished executive coaches, met in the inaugural year of Marty Seligman’s Master in Applied Positive Psychology (MAPP) program at UPenn. Inundated with positive psychology research but uncertain how to apply it, they found they were able to give business leaders an edge by sharing models and frameworks. By using positive psychology tools in coaching sessions, they were able to uncover best practices in how to apply them with their clients. After graduation from MAPP, when the two were visiting over a rainy weekend to bake blueberry pie and apple cake, an idea emerged of writing a book on business and positive psychology-for those who hadn’t heard about or experienced the positive psychology tools buried in academic sources. This sparked research into the burning questions their their clients had, all business leaders in different roles, positions, and industries. Three main themes were apparent from their interviews: how the leader needs to do, what the leader can do for his or her team, and how a leader can influence organizational change. The two authors launched a collaborative step-by-step program to write their book as they continued to work as executive coaches, one in California and one in Connecticut. They met weekly by phone and took on tasks between phone calls, always staying in action. They consulted with an expert agent, and met her challenge to rewrite their full manuscript into a crisp, concise volume that honed in on the book’s audience. And then they turned the book over to the publisher, who brought in experts in editing (again! ), graphic design, copyediting, publishing, and marketing. Their book manifested over “the most productive…and enjoyable 4-5 year collaboration (they) could have imagined”-through a natural process they’d used with their business clients to help them move forward on projects. Create a product for a need you see. Get client input early. Start up and keep it moving. Take the advice of experts. And do what you do best, letting other experienced people do what they do best. Margaret GreenbergMargaret Greenberg received her BA in Sociology from the University of Hartford, and her Master of Applied Positive Psychology from the University of Pennsylvania. She invested the first fifteen years of her career in Human Resources working for one large food retailer and then two financial organizations, where she consulted, designed and facilitated planning, leadership, and team development sessions. A desire to build something that combined her talents with her values led her down the entrepreneurial path, and she founded the Greenberg Group, a consulting firm dedicated to coaching business leaders and their teams to achieve more than they ever thought possible. 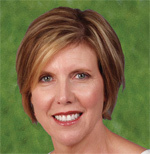 For sixteen years now, Margaret has been coaching individuals, partnerships, and teams using a strengths-based approach. Some of her clients include Aetna, Allied World, Hanover Insurance Group, Hospital of Central CT, ING, MassMutual, SNL Financial, The MITRE Corporation, Unum, Visa International, Yankee Energy, and Zurich Financial Services. One of Margaret’s specialties is working with executives who are called upon to lead large-scale organizational change. She is a sought-after executive coach by Fortune 500 companies. Margaret is certified as an Emotional Intelligence Coach and in numerous individual and team assessments to help clients discover and leverage their strengths to lead others. 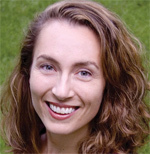 Margaret’s MAPP thesis study, “Optimistic Managers and Their Impact on Team Productivity and Employee Engagement”, was published in the peer-reviewed journal, International Coaching Psychology Review, and has been downloaded over 5,000 times. She has presented her findings at the International Positive Psychology Summit in DC and other venues. Highlights from her study were also published in two business articles by the widely known Gallup Management Journal: “It Pays To Be Optimistic – Exploring the Connections Between Optimism and Business Success” and “The Business Benefits of Positive Leadership – Finding the Connection Between Productivity and Positive Management Behavior”. She writes a column for Positive Psychology News Daily. Margaret lives in Connecticut with her husband and her two pugs, and she is the mother of two grown daughters. Senia MayminSenia Maymin, Ph.D., a co-author of Profit from the Positive, holds a BA in Math and Economics from Harvard University, a Master of Applied Positive Psychology from the University of Pennsylvania, and an MBA and PhD in Organizational Behavior from the Stanford Graduate School of Business. When entrepreneurs and executives seek far-reaching productivity improvements, they call on Senia as an executive coach and workshop leader. She founded and is editor-in-chief of a research news website (Positive Psychology News) featuring more than 1,000 articles by over 100 authors. Additionally, Senia oversees a site representing a network of coaches (Positive Coaches) that specialize in positive psychology methods. She has worked in finance on Wall Street and in technology as cofounder and president of two start-ups. She has been featured in the media–including PBS’s This Emotional Life, Business Week, Public Radio International, and USA Today–primarily for her work as a positive psychology executive coach. She has authored two books related to Positive Psychology, Resilience: How to Navigate Life’s Curves, and Gratitude: How to Appreciate Life’s Gifts. Senia lives with her family in California and speaks Russian, French, and Japanese.